With winter approaching, my cravings always turn to hot, bubbly dishes. 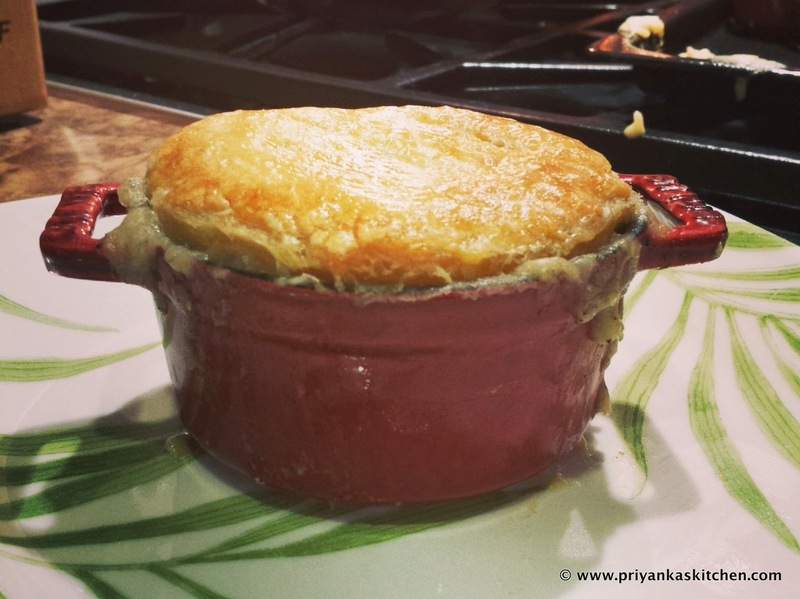 When I think winter, I immediately think pie – more specifically, POT PIE! This is a quintessential American recipe that defines comfort food for me (along with fried chicken and mashed potatoes). 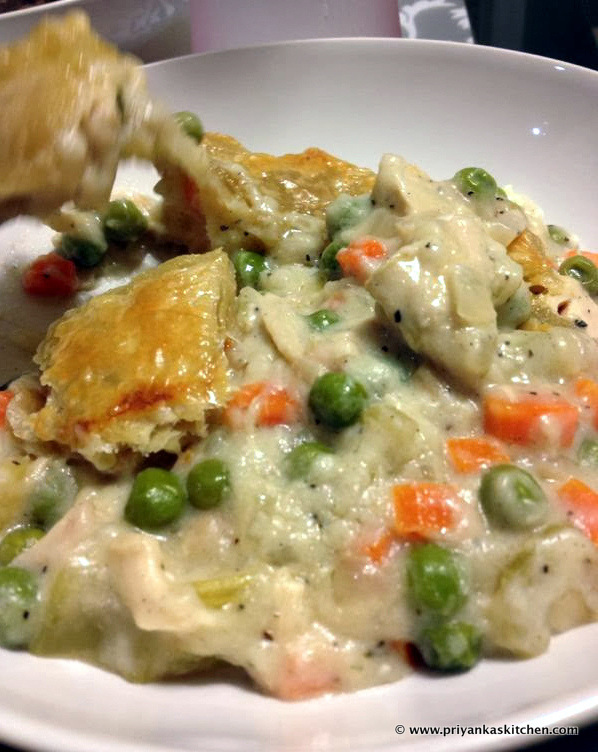 When I was testing this recipe, I used Ina Garten’s ever-famous recipe for chicken pot pie – why reinvent something that is already amazing? Although, I have to admit, I prefer my modifications that omit 30% of the butter, small pearl onions, and heavy whipping cream (only to be replaced by a beautiful, tangy yogurt cheese). I also added celery (I love the crunch that it brings!) and replaced the parsley with thyme since I believe the flavors are much better this way. I really hope you enjoy this recipe, my loves! 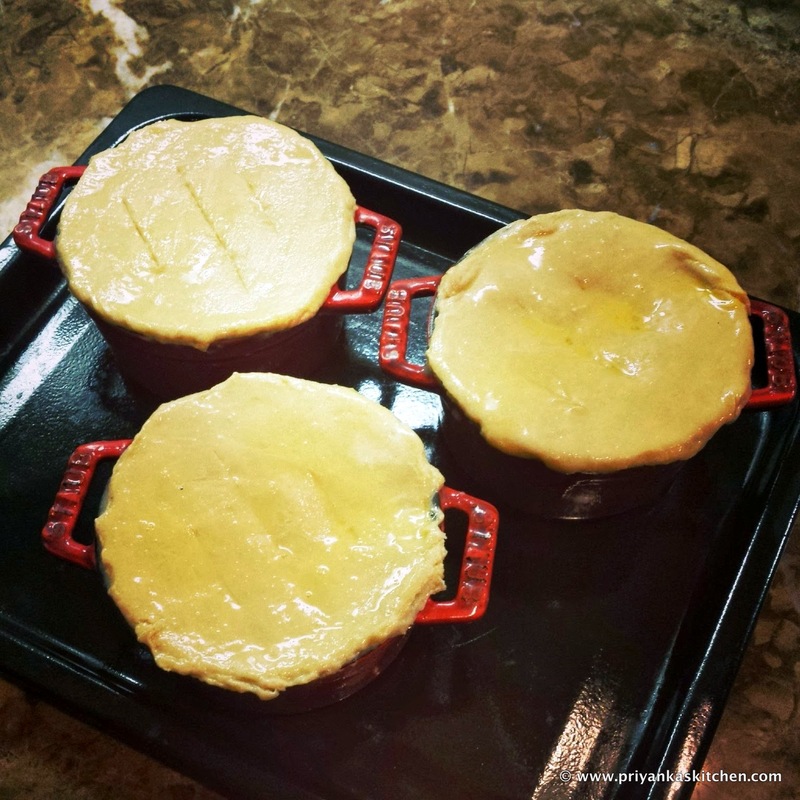 You can modify it serve a large group by baking this in a large serving dish that is oven proof and serving it casserole style – whatever your heart desires (see below picture on the look of your pot pie if you do it family-style!). You can also make this vegetarian by using vegetable broth and cutting the chicken out. 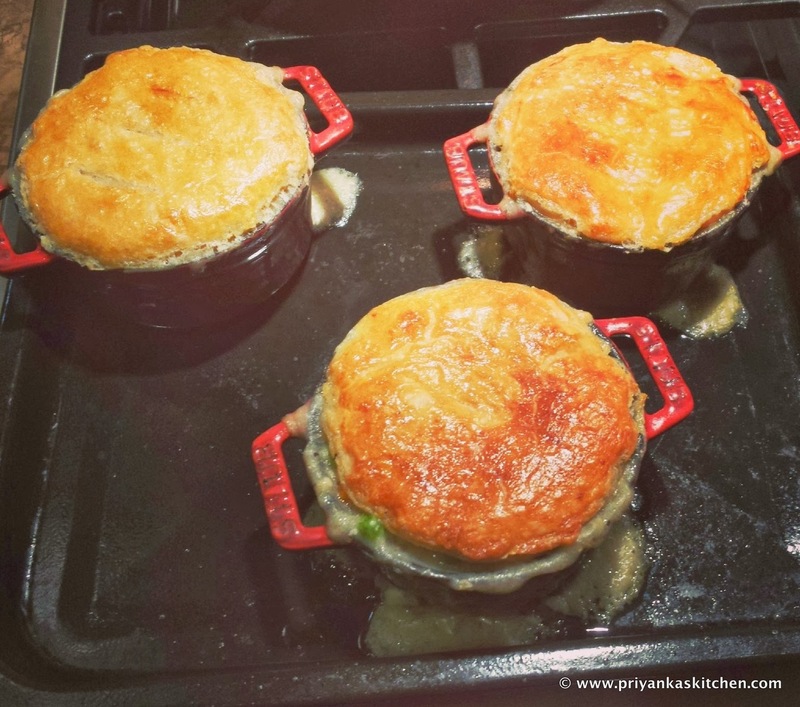 Or use beef or lamb meat instead for a spin on this – it will always be delicious – I promise! In a small saucepan, heat the chicken stock and dissolve the bouillon cubes in the stock. In a large pot or Dutch oven, melt the butter (half of the stick) and saute the onions over medium-low heat for 10 to 15 minutes, until lightly browned. 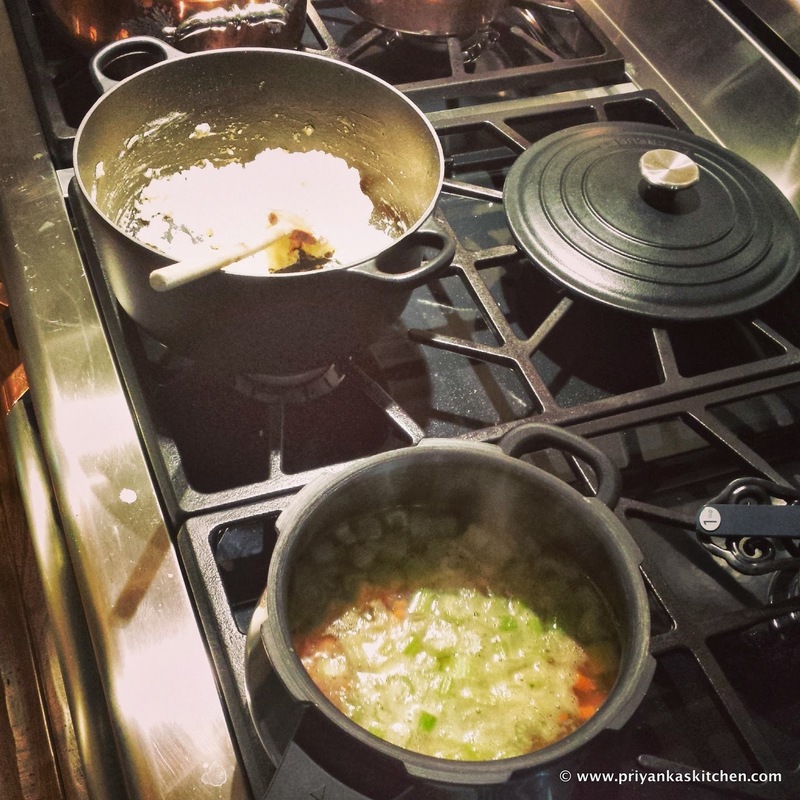 Once the onions are lightly browned, add the peas, carrots, and celery to the pot. Cook, stirring occasionally, until vegetables are tender (approximately 5 minutes). Add chicken broth to the pot and bring to a boil. Meanwhile, in a separate pot, melt the remaining butter (the remaining 1/2 of the stick). Add the flour and cook over low heat, stirring constantly with a wooden spoon, for approximately 1-2 minutes until the flour cooks a little. Add all of the hot chicken stock and vegetables to the flour. Continue stirring the mixture over low heat for another minute or so until well-incorporated and thick. Add 2 teaspoons salt, 1 tablespoon freshly cracked black pepper, and labneh. Add the chicken and thyme. Stir well until well-incorporated. Taste and adjust seasonings according to taste. Divide the filling equally among ramekins (oven-proof). Brush the outside edge of each ramekin with the egg-wash (acts like glue), and cover each ramekin with a circle of puff-pastry that is a little larger than the opening. Using your fingers, seal the opening with the pastry by crimping the dough to folder over the side. Brush the dough with egg wash and make 3 slits in the top with a sharp knife. Place on a baking sheet and bake for approximately 25 minutes, turning once halfway through, until the top is golden brown and the filling is bubbling hot. 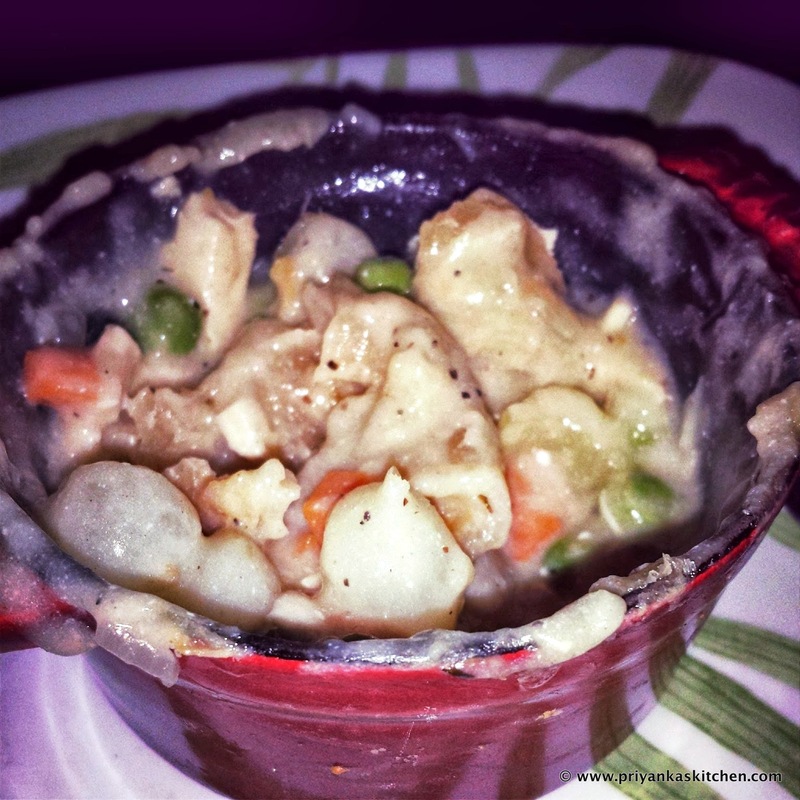 This entry was posted in Chicken, Fancy Dishes to Impress With!, Kid-Friendly, One-Pot Meal, Pies / Tarts / Crostatas, Vegetarian by priyankaskitchen. Bookmark the permalink. looks deeeelish! and it tastes amazing!! Thanks so much! !